Just the thought of having bed bugs crawling over your body at night is enough to drive anyone over-the-edge. If you are ever in a situation where you think you may be dealing with bed bugs, there is a new app that has the answers and information you need on what to do next. This new app was created by Dr. Susan Jones, a professor of entomology at Ohio State University. The research for this project was funded by a grant from the U.S. Environmental Protection Agency. Their goal was to set up a one-stop information source for everything you need to know about bed bugs. On the app, there are a number of photos. You’ll also find chapters dealing with bed bug identification, prevention, how to perform inspections, treatments, how to avoid being ripped off by scams, advice for travelers, and much more. The app is available for Android and iOS devices. 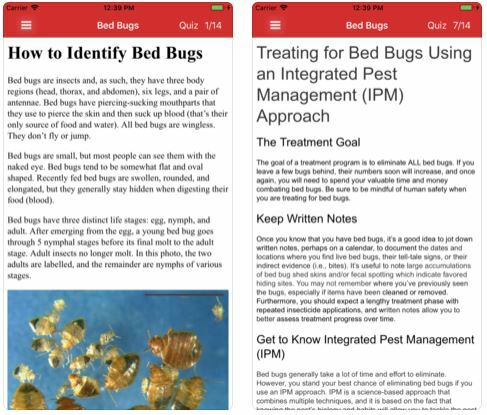 It can be downloaded for free by searching for “Bed Bug Field Guide” in the App store and Google Play store.